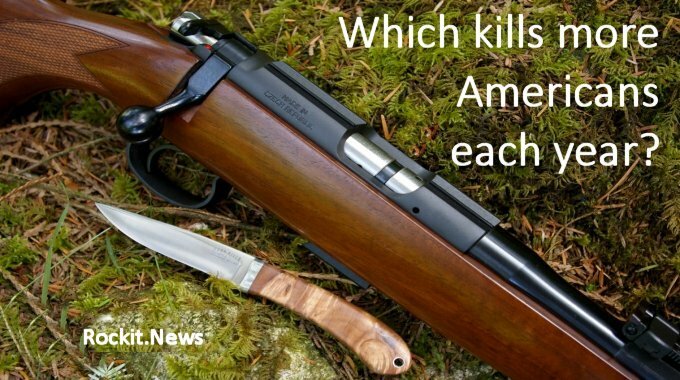 Did you know there are five times more people killed in the US every year by knives than by rifles? In 2013, according to official FBI statistics, rifles were used in 285 murders in America. Shotguns accounted for slightly more deaths, 308. However knives or cutting instruments were used in 1490 murders. So does this mean that the country is in desperate need of knife-control? The vast majority of gun-related deaths came from handguns, at 5,782. Most of these deaths were somehow related to drugs, and the very violent environment around it. Most of the persons behind massacres were dependent on psychotropic drugs. And drugs generate more crime. There are 324 million Americans…. And strangely enough, most gun crime occur were the gun control is the strictest, like in President Obama’s home-town of Chicago…. The states with the highest gun ownership and liberal gun laws have the lowest levels of gun crime…. In the end, the Americans have a Second Amendment Right to own guns and defend themselves if the government cannot protect them. Obviously it is difficult to compare the many lower density population states and cities with the metropoles, as a NYPD Deputy Commissioner once agreed with me. As much as Obama is trying to write laws bypassing Congress, which seems unconstitutional, he oversees the fact that those who cannot pass a background check, will not ask for one. On the other hand, if one needs a medical declaration of aptitude from an accountable doctor to have a drivers’ license, then perhaps something similar could be useful for owning guns? One should be able to find something that could at least give some improved control against drug addicts, mentally ill and criminals from acquiring and/or owning guns, just like convicted felons. Would that require a registry, or background checks? My personal opinion is that the Obama White House wanted to distract media attention from the increasingly aggravating chaos in the Middle East, which they created by O’s silly idea of the US military withdrawal from the region, leaving disaster behind. As well as creating some cheap domestic political points, and making the ignorant Europeans all excited about the “crazy US gun laws”…. The fact of the matter is that Switzerland’s gun laws are even more liberal than in the US, but with freedom follows responsibility and accountability. The US must start dealing somehow with its enormous drug problem, which led to the creation of the Narcos Cartels to satisfy demand, and so much of the overall crime. With the proven Convergence of Drug and Human Trafficking with Islamist Terrorism, this matter becomes even more dangerous and urgent, particularly with the migrants flowing across the US Southern borders… Europe has started to experience the same.